The Masquerade Costume Contest is a must see event at Omni Fandom Expo! Costumers from all over will take the stage and show off not only their incredibly crafted costumes but performances as well. On the runway, contestants will face off against each other for the "Best in Show" prize! If you have the desire, drive, and creativity to be the best, sign up and show everyone what you can do! 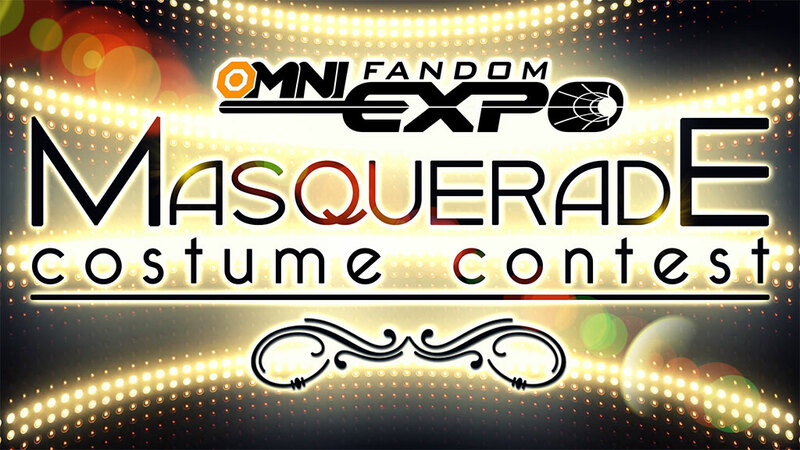 Come see what the contestants have in store for you at the Omni Fandom Expo Masquerade Costume Contest! Signup & Location: Location Symposium Hallway. Starts on Friday and runs through the start of the Contest in Main Events (walk-ons only after pre-judging has ended) or until the max person limit has been reached, whichever occurs first. All contestants / creators / models MUST have a current Omni Fandom Expo Badge (VIP Pass, Weekend Pass, Saturday Day Pass, etc. ), and a costume that has been at least 80% hand-made. Who may enter: Anyone EXCEPT Omni Fandom Expo owners, core staff, family members of owners / staff, Sponsored Cosplay Guests, Judges, significant others of judges, or owners and family members of affiliated partners may enter (if you are not sure this applies to you, ask before you submit an entry). Sign up is on-site, location TBD, at Omni Fandom Expo. If you are under 18, you will need a parent or legal guardian with you (they must be with you through all stages of the contest). If you are a model, the costume's creator must be present at sign-up to participate in pre-judging for craftsmanship awards. You will be given your pre-judging time when you sign-up. Download the entry form and fill it out or fill out an entry form at the sign-up location (TBD). It will require your name, the name and description of your costume, the name of the costume's creator (if you're modeling it for someone else), what skill level you qualify for, and any awards you have won. Do not bring any reference materials when you sign up. Please hold onto them until your designated pre-judging time. We suggest not wearing your contest costume at sign-up in order to keep your outfit as much of a surprise as possible for the convention's audience. If you are doing a cosplay skit/performance and have any audio that you want played, you must bring the audio in MP3 format ONLY on a USB Flash Drive and present it at signup. If accepted, it will then be copied for Omni Fandom Expo's use in the competition. Note: entrant takes all legal responsibility resulting in any damage or legal fees associated with any media presented/copied for use at Omni Fandom Expo. File must be on a USB Flash Drive. (Omni Fandom Expo will only copy your file and will not keep your Flash Drive). Filename must be the name of the contestant (first and last) followed by a dash (-) and then the name of the skit. Reference materials are REQUIRED to participate for awards. Reference materials can be presented in any media that can be easily viewed by the judges. Color photos are encouraged. In-progress photos detailing the costume/prop/elaborate wig construction are REQUIRED to be judged for craftsmanship awards and Best in Show. At least one photo must show the person entering is making/working on the costume/prop/etc. Yes, you may enter the contest as a walk-on! Walk-on Only (meaning no pre-judging) costumes will ONLY be considered for all non-craftsmanship awards. IMPORTANT: If you enter as a Walk-On only and do not participate in pre-judging, you will not qualify for Best in Show or any craftsmanship award! ENTRIES: One entry per person. Cap of 100 entries taken. Limited Late Registration will be available if space permits. We reserve the right to refuse additional entries. PERFORMANCES/SKITS: Due to time contraints, a limit of 20 of the 100 entries may be Performances/Skits. First come, first serve. All Masquerade content must stay within the Omni Fandom Expo General Guidelines, Code of Conduct, Prop / Weapon Policy, City of Orlando ordinances, The Florida Hotel & Conference Center's guidelines, and not exceed a PG-13 rating. In addition to these basic guidelines, swearing and depiction of sexual acts is forbidden. Bleeps or other forms of censoring are acceptable. All skits / performances may not exceed 1 minute 30 seconds. The MC (Master of Ceremonies) or Contest Host narration/introduction will not count towards the performance time. “Cosplay” aspect is to show that you can not only look the part of the character, but also act the character as well. The judges should believe that you are your character - "suspended reality". This aspect is to demonstrate that you know your character inside and out. Any presentations with stunts, extreme, or shocking performances must be approved by the Masquerade Costume Contest Coordinator before the event. Failure to do so may result in disqualification. Any eligible costume that wishes to compete for craftsmanship awards must participate in a preliminary costume judging. Any costume not taking part in preliminary judging will not qualify for Best in Show or any craftsmanship awards. No make-up times will be allowed. This is a technical-based contest for Best in Show and craftsmanship awards. All costumes being considered for those awards must be at least 80% hand-made. Youth is 12 and under. Parents MUST accompany contestants. Handlers are allowed; however, oversized costumes REQUIRE a minimum of one (1) handler to go on stage with them. Oversized costumes MUST provide their own handler ( minimum of one (1) ) in accordance with Omni Fandom Expo General Guidelines. Models are allowed, but the costume/prop fabricator must be present for the costume to qualify for awards. Again, Sponsored Cosplay Guests are disqualified from entering the Masquerade Costume Contest for the fairness of all contestants. Finally: Please remember that the purpose of this show is for fun and entertainment. It's to celebrate everyone's creative inspiration, ability, and passion for this beautiful art form. Please do not get so caught up in the idea of winning an award that you forget that there's an audience watching you, or the other contestants waiting for their moment on stage, or the staff who is producing the contest itself. This is for everyone's enjoyment. Also, many of the Omni Fandom Expo Staff have been in masquerade contests themselves, so we know how it feels! Thank you for being part of this awesome fan event, and enjoy! Costumes that have previously won any award above a judge's award or honorable mention are not allowed to enter. Cosplayers that have received a Best in Show award at a previous event will automatically be placed in Masters Division. Entries of any skill level may sign up for pre-judging for awards. The costume maker's skill level will be taken into consideration by the judges during pre-judging. Representation of your costume compared to the original character design. Appropriate scaling and dimensions from concept to reality. Choice of fabrics and materials for construction. Judges are free to consider any artistic and technical factors at their own discretion. All costumes entering for craftsmanship awards must be of original construction or show significant modification to pre-existing materials. No purchased costumes are allowed. If you have any questions or concerns, please check with the Masquerade Costume Contest Coordinator for approval before entering for awards. Costumes/props/elaborate wigs must be at least 80% hand-made. Because this requires repeating: All content MUST comply with the Omni Fandom Expo General Guidelines, Code of Conduct, Prop / Weapon Policy and Orlando City ordinances, and The Florida Hotel & Conference Center's guidelines. Nothing should exceed the PG-13 rating. This means no swearing, no depiction of sexual acts. Bleeps or other forms of censoring are acceptable. Microphones will not be provided on stage for contestants to use. Any dialogue audio must be pre-recorded. The use of GLITTER, flash powder, fake blood, fireworks, lasers, electrical flashes, smoke machines, silly string, or any other effect that may cause potential damage, by the entrant are PROHIBITED due to Fire Marshal and The Florida Hotel & Conference Center regulations. The use of any of them will / may cause immediate disqualification and/or removal from the convention. Please ask before you attempt to use any of these effects. Interaction with the MC, Contest Host, Judges, or the audience is prohibited while on stage. Take your time to show off your costume to the audience for photos! It is always suggested to stop for two (2) poses, holding each for a count of three (3) to five (5) seconds a piece. Do not move too quickly through your poses, or the audience won't be able to get good pictures! Best in Show wins $500 USD. Prizes sponsored by Omni Fandom Expo Sponsors, participating events, and dealers. Can I use a microphone during my cosplay? No, contestants will NOT be given microphones on stage. Contestants are highly encouraged to pre-record all vocals on an audio track. I have an oversized costume. How do I get it on stage? At this point, there is no lift or ramp to get an oversized costume onto our stage. If you are in an oversized costume that cannot navigate the stage stairs, you and your required handler(s) will be guided around to the front of the stage. If there is a change in this procedure, or other ways of getting on the stage are acquired, it will be posted here and you will be notified at the event. I can make it up the stairs with my giant Mech costume! Trust me! First off, we love your giant Mecha costume. Secondly, your attempt to go onto the stage in an oversized costume is at the discretion of the Masquerade Costume Contest Coordinator – should you choose to ignore this, it is at your own peril of injury and/or disqualification. Trust us instead, as we are looking out for everyone's safety. I am going to totally ignore the rules and do something incredibly cool like shoot fire out of my costume! It's an Awesome surprise, so I am not telling anyone including the Judges or the Masquerade Costume Contest Coordinator. While that might sound really awesome, and your costume might be really awesome, this idea could get you Awesomely disqualified and then possibly (depending on what you did) Awesomely ejected from the convention. We aren't even going to talk about how Awesome the rules of Orlando City Ordinances are or how Awesome getting arrested for breaking them are. My skit was rejected. What do I do now? No, you cannot normally modify your entry once it is turned in. You must speak to the Masquerade Costume Contest Coordinator directly and explain why it needs to be modified. Any such modification is up to the sole discretion of the Masquerade Costume Contest Coordinator. What if I have large costumes, props, and set pieces for my cosplay? Special arrangements for loading and unloading can be made for these items. Please consult with the Masquerade Costume Contest Coordinator ahead of time about your needs. What if I didn't make my costume? Can I still win Best in Show? If you did not make the costume you are wearing and the Creator of the costume is with you, the CREATOR may win the award. You however are just a model in this situation. The Creator of the costume must be present at Omni Fandom Expo, have a valid pass, be entered on the signup form as the Creator, and be present during the signup / pre-judging process, and stage competition. You cannot enter and then have the Creator show up at the last moment without them being a part of the process. So, does that mean I can win Best in Show if i make a costume for my child? Yes, a Parent can win best in show for creating their child's costume; however, the award is given to the Creator and not the model (child) since the Creator (parent) did the work. I didn't win anything and my costume was the best! Everyone will hear of this! We are sorry, but not everyone wins all the time. The judges decisions are final. We honestly hope that everyone understands the spirit of what this competition is. Striving to be the best is important, but not at the expense of ruining things for everyone else. Be happy for the winners and ask them how they made their costumes. Maybe you will make a new friend who is willing to help you with yours.